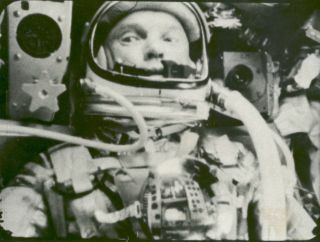 Astronaut John Glenn photographed in space by an automatic sequence motion picture camera during his historic orbital flight on "Friendship 7" on Feb. 20, 1962. Fifty years ago, John Glenn became the first American to orbit the Earth, and his nearly five-hour expedition ushered in a new era of spaceflight for the nation. On Feb. 20, 1962, Glenn piloted NASA's Mercury capsule, known as Friendship 7, three times around Earth, reaching a maximum altitude of about 162 miles (261 kilometers). Glenn's orbital milestone matched the groundbreaking achievement of the rival Soviet Union, which launched cosmonaut Yuri Gagarin into orbit 10 months earlier. On Monday (Feb. 20), NASA will salute 50 years of Americans in orbit by honoring Glenn and his Friendship 7 flight. Since that fateful journey, the agency landed astronauts on the moon, flew 135 space shuttle flights and constructed a $100 billion laboratory in space, among many other accomplishments. Following the Friendship 7 flight, Glenn was heralded as an American hero, and five decades later, his orbital journey still resonates with the public. Part of this fascination is because the success of Glenn's Friendship 7 flight altered the tide in the fierce Cold War competition between the U.S. and the former Soviet Union. The Soviets launched the first artificial satellite, Sputnik I, in October 1957, four years later, Gagarin became the first person to reach space (and the first to orbit Earth) on April 12, 1961. "The Soviets at that time were claiming technical superiority to the United States because they could do rocket flights and ours were blowing up on the pad too often," Glenn said. "So it was against that backdrop and their claims of superiority in rocketry that we came into the program. It was something that we felt at that time, so there was a big effort to get us back on top again." On Feb. 20, 1962, John Glenn rode the Friendship 7 capsule into space, the first time an American orbited the Earth. In this image, Glenn enters the capsule with assistance from technicians. After years of Soviet dominance, Glenn's success in orbit evened the playing field and reinvigorated America's space program, said John Logsdon, space policy expert and professor emeritus at George Washington University in Washington, D.C. The flight also captivated the public, and after returning to Earth, Glenn received a hero's welcome in New York City. "It was the first of the ticker-tape parades through Manhattan," Logsdon said. "Everyone was glued to their television sets. It was new, exciting and adventurous." It was after seeing Glenn's New York City parade that Logsdon himself was inspired to pursue a career related to space. "I was in transition back to graduate school that spring and going into political science, and I remember very vividly seeing Colonel Glenn parade through Manhattan on March 1, 1962. And it was that more than Kennedy's speech or Sputnik that got me interested in space." This image shows the launch of Friendship 7, the first American manned orbital space flight. With astronaut John Glenn aboard, the Mercury-Atlas rocket is launched from Pad 14, February 20, 1962. Glenn, who was born in Cambridge, Ohio, in 1921, was one of NASA's original seven astronauts — the so-called Mercury Seven. The trials and tribulations of those involved in Project Mercury were later immortalized by author Tom Wolfe in "The Right Stuff." Selected in 1959 for the agency's first astronaut class, Glenn beat out a pool of 508 skilled, high-flying pilots and military men. While fellow Mercury Seven astronauts Alan Shepard and Virgil (Gus) Grissom flew to space before Glenn, the maximum altitude for both their flights put them only in the suborbital reaches. On that February day in 1962, Glenn circled the Earth three times in the Friendship 7 capsule before splashing down in the Atlantic Ocean. He became a pioneer for orbital spaceflight, and NASA would continue to push the boundaries of exploration. And after years of Americans in orbit, Glenn hopes to see that tradition continue. "I see exploration going two directions: one is macro, which is out to Mars or wherever we're going out into space and back," Glenn said. "But to me, wherever we go we should try to maximize the research return of the capabilities we are developing. And that is what develops the support for the program. It does more good for people right here on Earth and does more to support the program for the long term than anything else we could do." For instance, more emphasis should be put on the research capabilities of the International Space Station, he added. "To me, we have never really exploited our ability in low-Earth orbit," Glenn said. "The International Space Station is the most unique laboratory ever built by human beings. It cost us over $100 billion and about 18 years to get it to the condition that it is in. We should be working on ways to do the research that makes the whole program doubly beneficial in addition to just seeing how far we can go and keep someone alive and bring him back." Glenn left NASA in 1964 and entered into business and politics. He was elected to the United States Senate, representing his native Ohio as a Democrat, and served from 1974 to 1999. "Glenn's space career is only one facet of his life," Logsdon said. "He was a very productive senator and he made his mark on American society in a number of ways." And in 1998, at age 77, Glenn flew to space again on the shuttle Discovery's STS-95 mission. After spending almost nine days in space, Glenn became the world's oldest astronaut, a title he still holds. Shortly before his return to space, Glenn announced the creation of the John Glenn Institute (now the John Glenn School of Public Affairs) at Ohio State University in Columbus. The school featured a special exhibit about the Friendship 7 flight on campus and will lead a series of spaceflight forums and panels to mark the 50th anniversary. "John Glenn is, quite simply, an extraordinary American patriot," E. Gordon Gee, president of Ohio State University, said in a statement. "He is a man of boundless courage, limitless optimism and unswerving honor. I am deeply grateful for this opportunity to celebrate his tremendous achievements and his important leadership at Ohio State. He is one of this university’s — and this nation’s — greatest treasures." The school is also hosting a gala dinner Monday to honor Glenn and his achievements. Former NASA astronaut Mark Kelly, who commanded the space shuttle Endeavour's final flight, will speak at the event. The seven crew members in training for the STS-95 mission aboard Discovery pose for photographers prior to participating in a training session at NASA's Johnson Space Center. Pictured, from the left, are Pedro Duque, Curtis Brown, Chiaki Nauto-Mukai, then-U.S. Sen. John H. Glenn Jr. (D.-Ohio), Stephen Robinson, Steven Lindsey and Scott Parazynski. NASA is also holding special events to mark the occasion. Today (Feb. 17) at 10 a.m. EST, NASA chief Charles Bolden and Kennedy Space Center director Bob Cabana will host a special program on NASA Television with Glenn and fellow Mercury astronaut Scott Carpenter. Three months after Glenn's Friendship 7 flight, Carpenter became the second American in orbit on May 24, 1962. A news conference will be held at 3 p.m. EST at the Kennedy Space Center Visitor Complex in Cape Canaveral, Fla., in the Mercury Mission Control exhibit. This event will be broadcast on NASA TV. On Saturday (Feb. 18), Glenn and Carpenter will participate in a ceremony at the Kennedy Space Center Visitor Complex honoring those who made Project Mercury possible. Cabana, Sen. Bill Nelson (D-Fla.) and astronaut Steve Robinson, who flew with Glenn on Discovery's STS-95 mission in 1998 will speak at the event. On Monday (Feb. 20) at 1:30 p.m. EST, Glenn and NASA administrator Charles Bolden will speak live with the crew aboard the International Space Station. On March 2, Glenn will deliver the keynote address at a special event, called "Celebrating John Glenn's Legacy: 50 Years of Americans in Orbit," hosted by NASA's Glenn Research Center in Cleveland, Ohio. The agency's Glenn Research Center is named for the astronaut. SPACE.com contributor Robert Pearlman, editor of the website collectSPACE.com, contributed to this report. You can follow SPACE.com staff writer Denise Chow on Twitter @denisechow. Follow SPACE.com for the latest in space science and exploration news on Twitter @Spacedotcom and on Facebook.